Introducing liquid enamel! Most contemporary artists working in enamel today use this versatile and often surprising material. It lends itself to experimental techniques in both graphic and textural designs. Unlike the enamels that most people are familiar with, this product includes 10% clay and electrolytes. It can however be used in conjunction with regular enamels to create even more interesting effects. We will also discuss and use separation enamel and crackle bases. 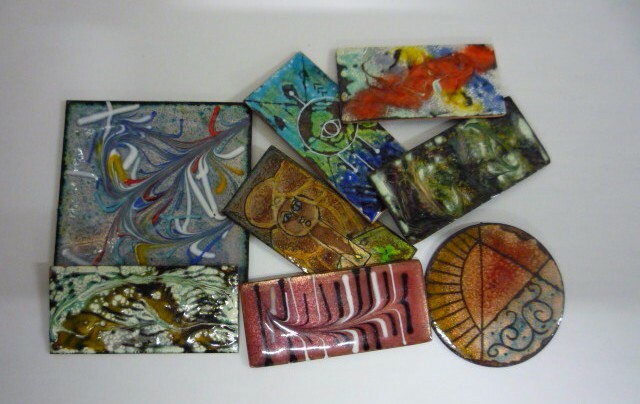 Over the course of the two-day workshop you will be introduced to several experimental techniques including throwing, dripping, sgraffito, drawing, patterning, crackle, breakthrough, raku enamel and scrolling. Students can expect to make at least three pieces using and/or combining these techniques, and go home with detailed notes to support their continuing enamel practice.